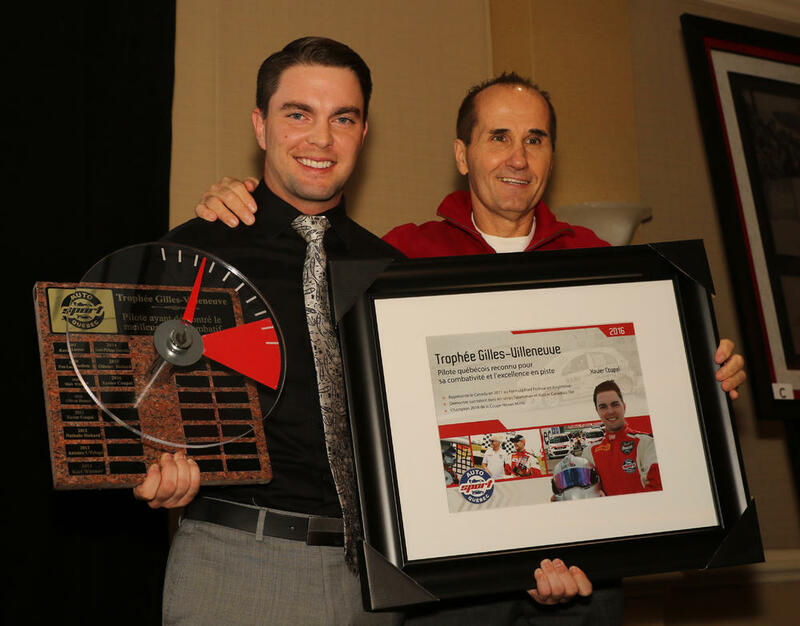 After a spectacular 2016 Nissan Micra Cup season that crowned its winner at the very last event of the season, Quebec driver Xavier Coupal saw his efforts rewarded with the Gilles Villeneuve Trophy, one of the most prestigious annual awards in the world of Quebec motorsports. Xavier Coupal joined the Nissan Micra Cup in 2016 and was immediately recognized as a top contender. On the track, he was consistently among the other drivers vying for each victory, as well as the overall championship title. By the end of an eight-round (sixteen-race) season held on tracks in Quebec and Ontario, the driver from St-Jean-sur-Richelieu (Quebec) finished on top of the podium nine times, which is more than one win for every two races. His victories took place on the circuits at Calabogie (one win), Mont-Tremblant (five wins), Canadian Tire Motorsport Park (two wins) and during the Grand Prix de Trois-Rivières (one win). Coupal is one of two drivers in the 25 year history of the Gilles Villeneuve Trophy to receive this award twice. The first time he was awarded the trophy was in 2011, when he was honoured as a driver for the Canadian team in the Formula 1600 World Openwheel Championship in England. This year, Xavier was awarded the trophy during the banquet at the Gilles Villeneuve Museum held at Montreal’s Loews Hotel on Tuesday, October 25th. Created in 1982, the Gilles Villeneuve Trophy is awarded by Auto Sport Québec (Quebec’s representative of the Fédération Internationale de l'Automobile) and symbolizes a Quebec driver’s perseverance and racing excellence. Gilles Villeneuve, who was born in Chambly in 1950 and deceased on May 8, 1982, encouraged the public’s interest and love of motorsport like no other. His charisma and aggressiveness on the track made him a legend around the world, and not just with Formula One fans. Each year, a committee of experts (drivers, journalists and celebrities) select the recipient of the Gilles Villeneuve Trophy. The 2016 winner, Xavier Coupal, follows in the footsteps of many drivers who have made history in Canadian motorsport including Patrick Carpentier (1994), Alexandre Tagliani (1996), Andrew Ranger (2002) and, of course, Olivier Bédard in 2015. The Nissan Micra Cup will return to the tracks again next year. Officials are currently finalizing the calendar of events, which will be announced during the winter. Visit the series’ Facebook page Nissan Micra Cup for news and updates.